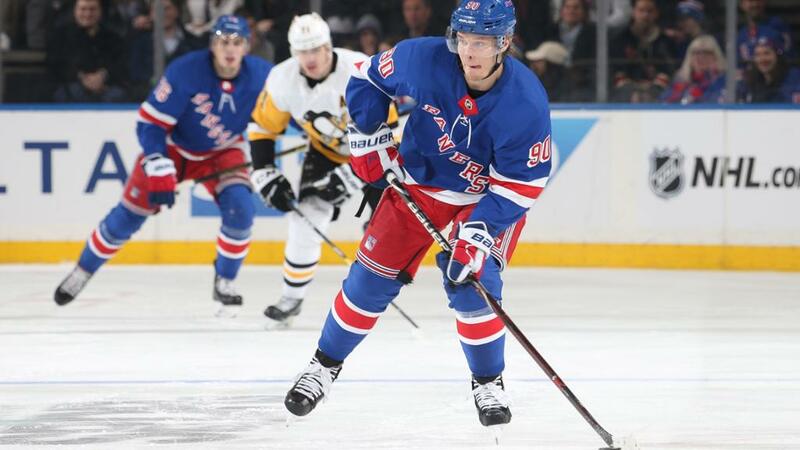 The Blueshirts were hoping Alex Georgiev had some more Toronto magic in him, but the Penguins took advantage of porous Rangers defending and a non-stellar night from the Bulgarian netminder en route to a runaway 5-2 win. Rookie Teddy Blueger put the Rangers away with a shorthanded goal late in the second and then a dagger midway through the third. This game was lost in the second when the Rangers started to trade chances with the Penguins and get into a track meet. Even without Evgeni Malkin or Kris Letang, the Penguins will win that nine times out of ten. The Rangers got points from six players who are 25 or younger, including four rookies. That’s good! The Rangers also got 35 shots on goal. That’s good too!There’s still some fun stuff to watch over the last two weeks of the season. The MSG broadcast had a nifty zoom cam on Filip Chytil all night. I used the cam to see where he was on the ice, locate him, then watch him without the puck. He looked more confident and had a nose for getting to the net. He also leveled a ref, which was fun. Brendan Lemieux made a good play by the blue line to force the turnover and then start the rush. Mika Zibanejad to Pavel Buchnevich, with the vision to Lemieux as the third man for the goal. This is a great pass by Tony DeAngelo, and an even better shot by Vinni Lettieri. John Gilmour chased a little too high here, but Neal Pionk did a good job covering the slot. Boo Nieves lost Nick Bjugstad who was able to beat Georgiev after Marcus Pettersson’s shot was stopped. Sidney Crosby made a good pass from behind as Justin Schultz found open ice in the high slot. Georgiev didn’t have a chance here. There is a slight cheat here by Georgiev on the Matt Cullen shot, but it isn’t much. This is just picked perfectly. Cullen sold the pass and then picked that corner. This goal made the Rangers feel Blue(ger). An odd-man chance with a diving Lemieux was missed, but Teddy Blueger was able to recover before both Lemieux and Georgiev to tuck it in. Georgiev mishandled this one. It happens. The difference between the Penguins and the Rangers is that the Penguins got the majority of their chances from in front. The Rangers did not. Against a high-end team like Pittsburgh, that spells disaster. The Blueshirts have seven games left, playing those even games in eleven days to close out the year. Given their opponents, there’s a chance we may only get one or two more wins the rest of the year. "Penguins score five straight, down Rangers", 5 out of 5 based on 2 ratings. As usual, cream goes to the top, and last night the Pens were where they deserved to be, on top. We gave them a bit of a scare in the first, but they have too many tools to work with, even without Igor Malkin, and Latang…………………. The only saving grace is that we didn’t move back in the standings, still in the fifth position, even though the Devils, and Wings won!!!!!!!!!!! The Rangers have been in “stealth tank mode” since the trading deadline. May they play well and lose a lot the rest of the way! I am so glad we didn’t get a point, but played a solid period against a much better team.